First up, Batman’s plan (and part of today’s article title). I’m no expert on adoptions, and I’m sure the state wouldn’t be pleased by a man in a bat costume raising Drake, but random men can only claim kids as their own as long as no other possible options exist (I assume). 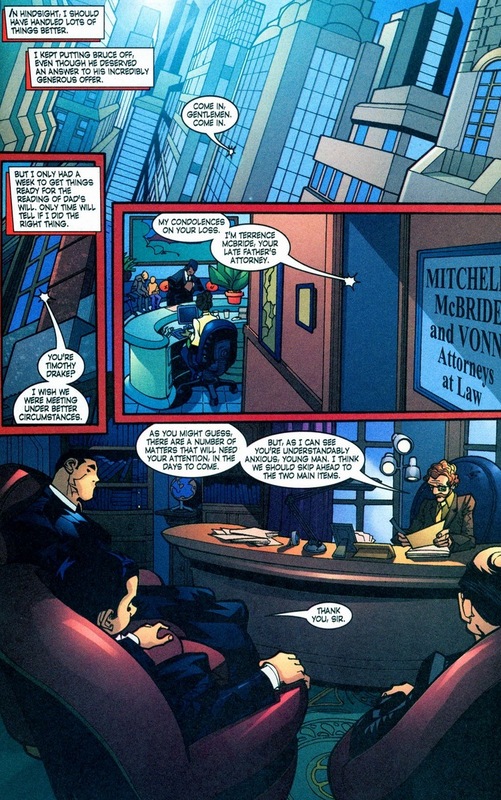 I mean, surely Robin can take care of himself — he’s had a solo series for since the early ’90s after all, but when it comes to laws Batman’ll break (like trespassing, assault, illegal wiretapping, etc. ), he follows adoption procedures to the letter. 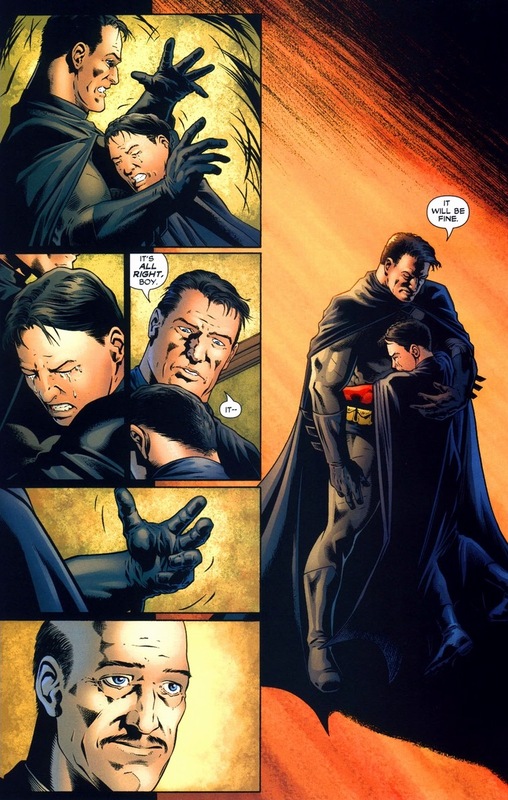 Well, no more Tim Wayne for Tim Drake. Bring the world adventuring uncle back home and Tim’ll get a proper house and other problems he’ll have to lie about to his new family member. Look, it’s not as if this is anything new to poor Robin. 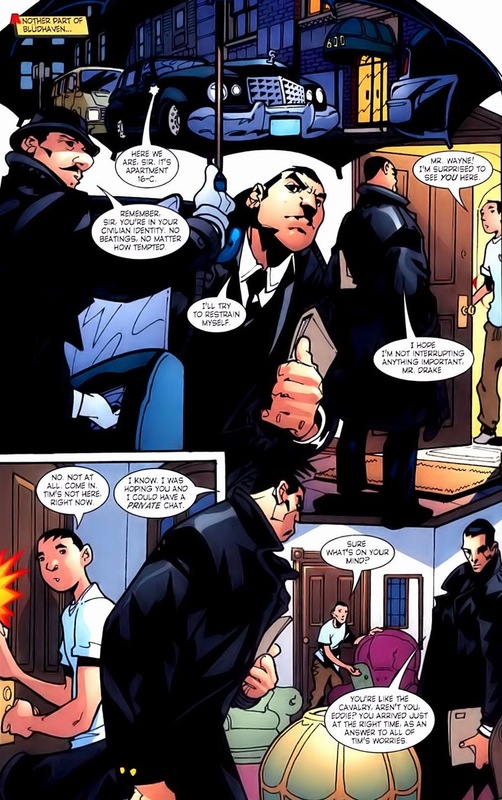 All he wants is the freedom to not attend school, patrol by himself, and do all those great adult things Batman, Nightwing, Batgirl, and the others get to do. 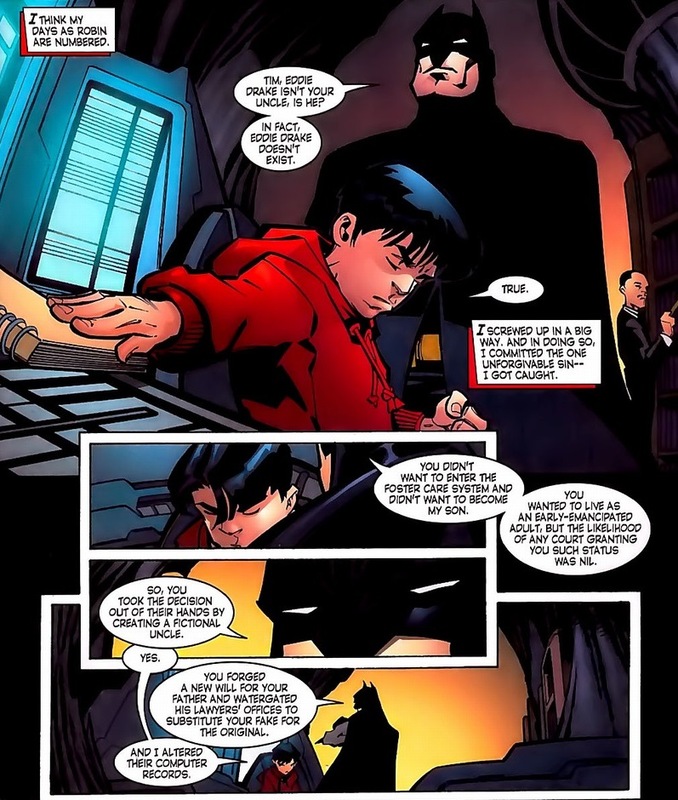 Even Batman would make Robin sit through classes and complete his homework before giving permission to jump kick bad guys. Such is the life of a 15 (or 16?) year-old kid. How sweet, right? Edward Drake looks like a cool dude, like that uncle who lets you smoke a cigarette once in a while as long as you bring your female friends around for him casually leer at. 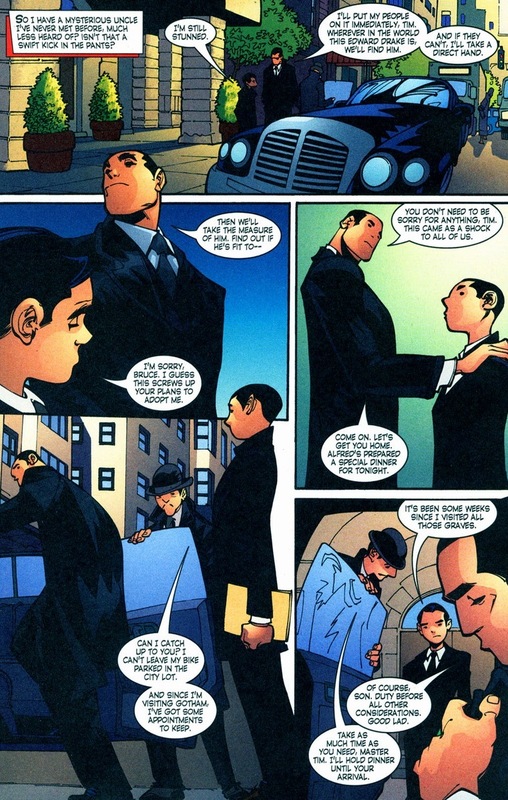 Maybe he won’t mind his nephew fighting crime. 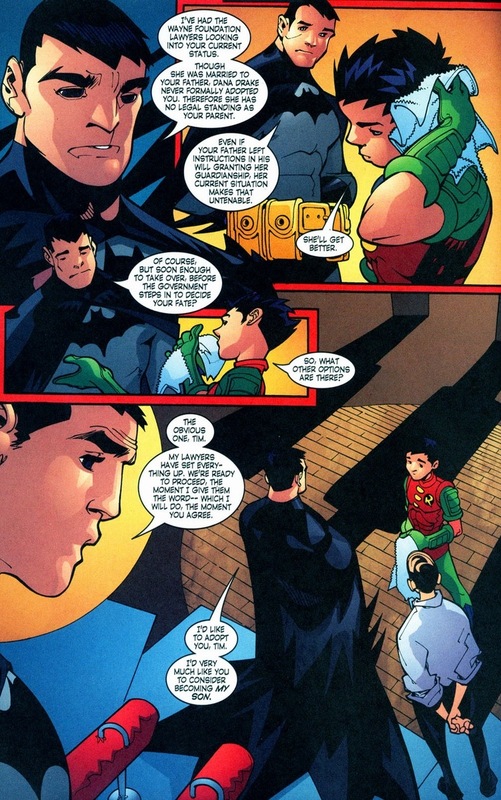 Maybe he’ll use his doctoring skills to aid Robin. Maybe he leaves loving hand-written notes in Robin’s lunch bag every morning. Or maybe he’s a great big fraud. Probably the last one. 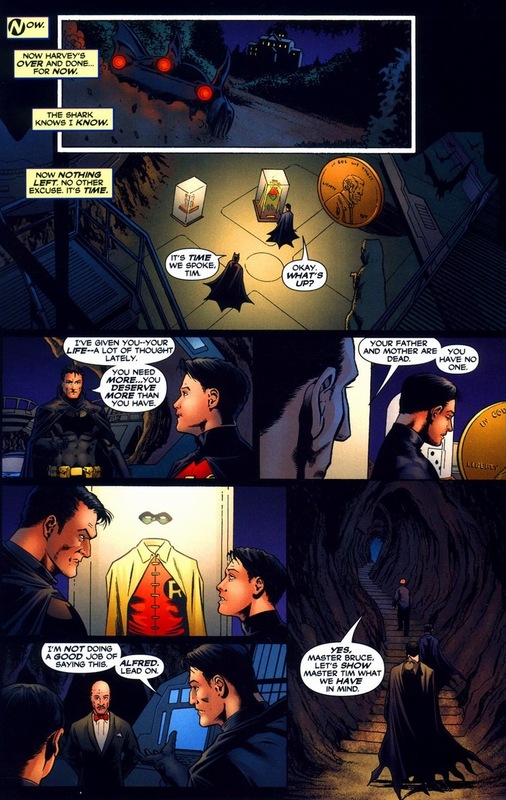 It’s not bad that Robin lied to Batman. 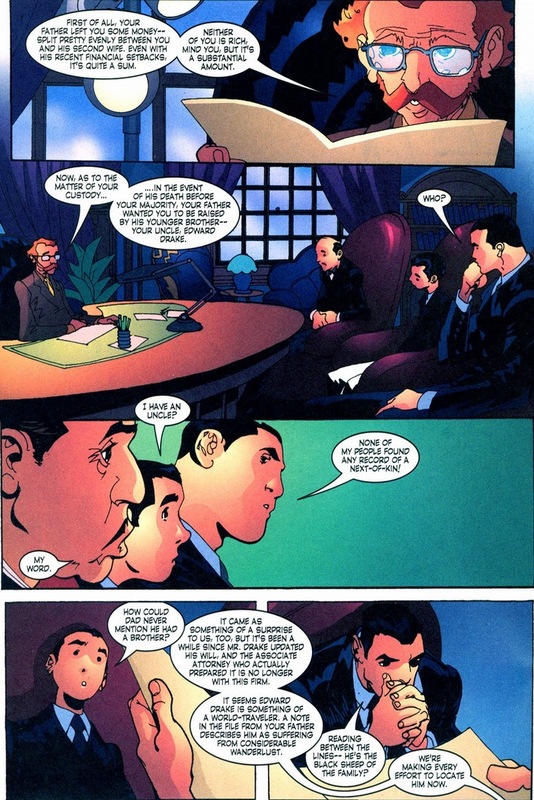 It’s bad that he lied to the person with the most powerful, comprehensive computer in the entire world along with the single greatest problem-solving mind hidden behind any mask in the DC universe. 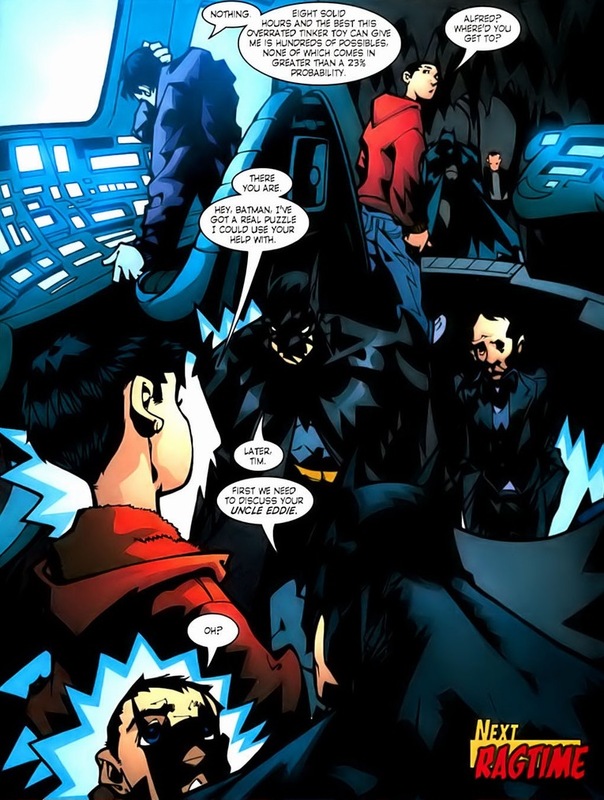 Batman makes up for his lack of super strength by being superhuman at everything else. Like being super scary. 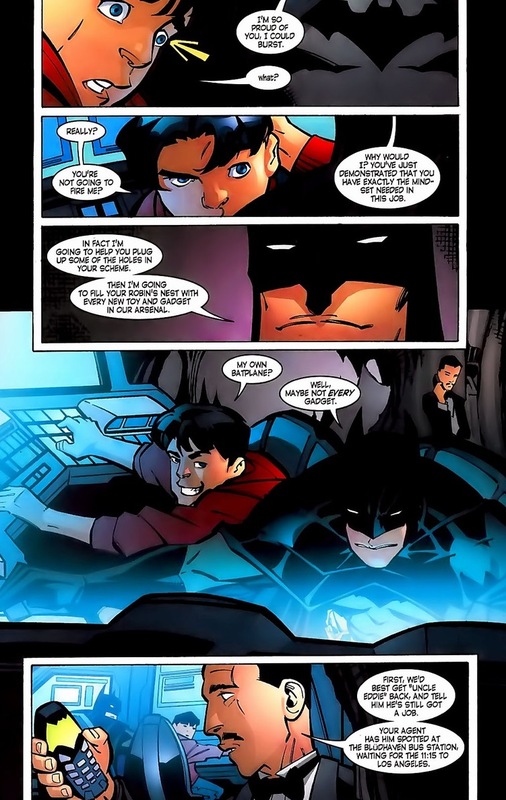 Drake even gets a half-smile from Batman, the largest grin possible from his brooding mentor. As for dear Uncle Eddie, he appears in one more scene after this and then never again. 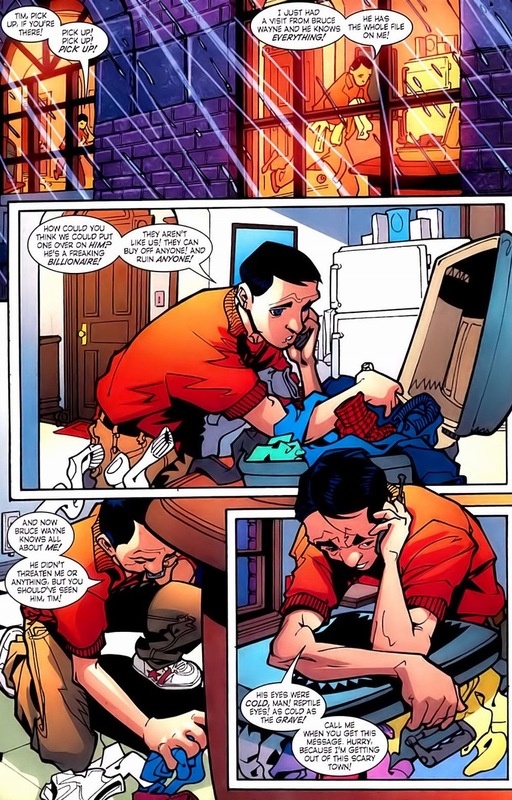 He doesn’t die or anything — a girl shows up at the apartment, Robin asks for some alone time, Eddie leaves, and we never see or hear from him again. Much like the parents of many other superheroes. It’s simply an unsolved plot line dangling eternally in the bowels of comic book history. 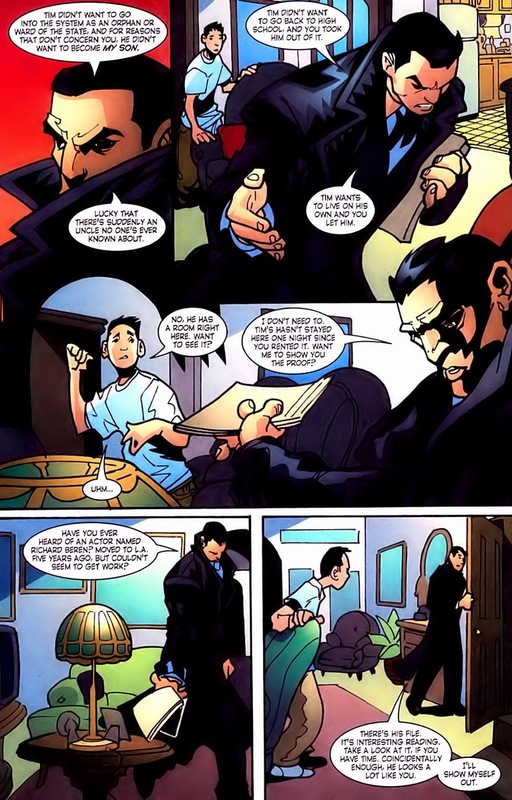 A year later (in both comic book time and real life time), Batman asks Drake once more if he’d do the honor of being adopted. It goes exactly as you expect: heart-warmingly. 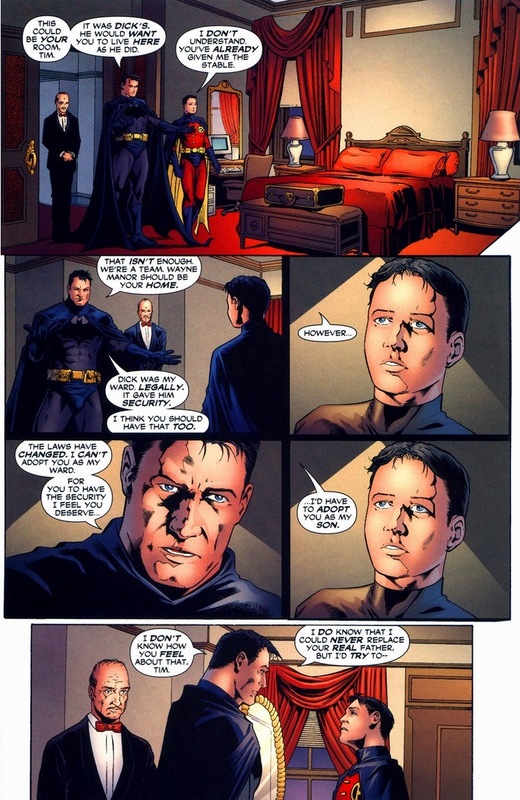 Wouldn’t it seem strange that a single man adopts a teenage boy that he had no previous (public) connection to? 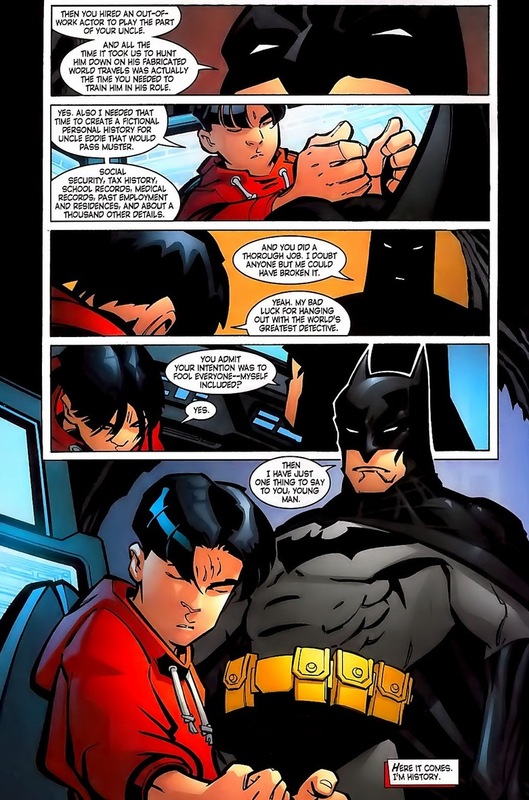 I mean, if Bruce was a close friend of Tim’s family, it would make sense, but as is, it would raise eyebrows, especially since it might cause people to put 2 + 2 together and = “Batman and Robin”. 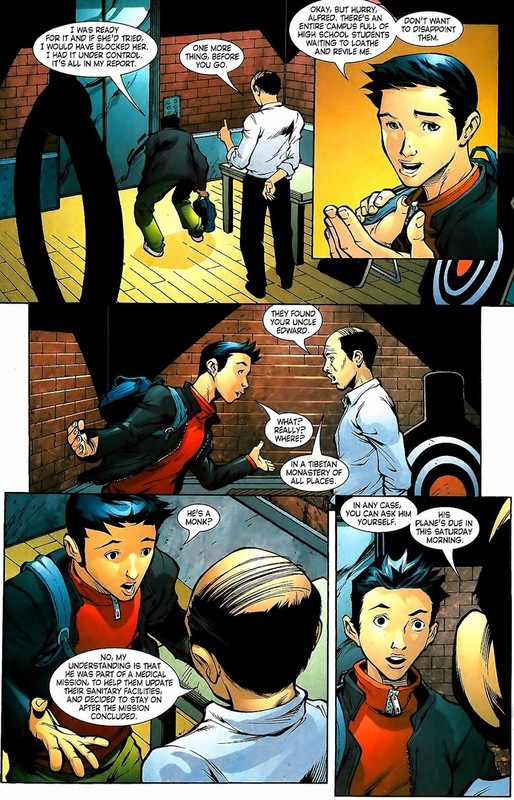 haha, that is pretty much how Tim figured out who Nightwing and Batman were in the first place, leading to him becoming Robin himself. 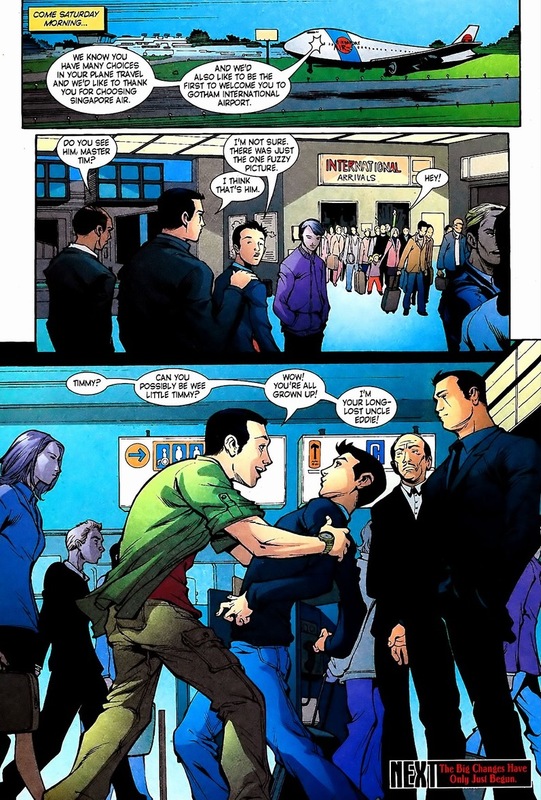 If I remember right, he saw news footage of Nightwing doing a move he remembered Robin doing, that the Flying Graysons used to do. A to B to C and we got a new partner for Batman. I remember that second offer, but I had no idea there was such a convoluted first offer. It’s like something they would’ve concocted in the Silver Age and then forgotten about! 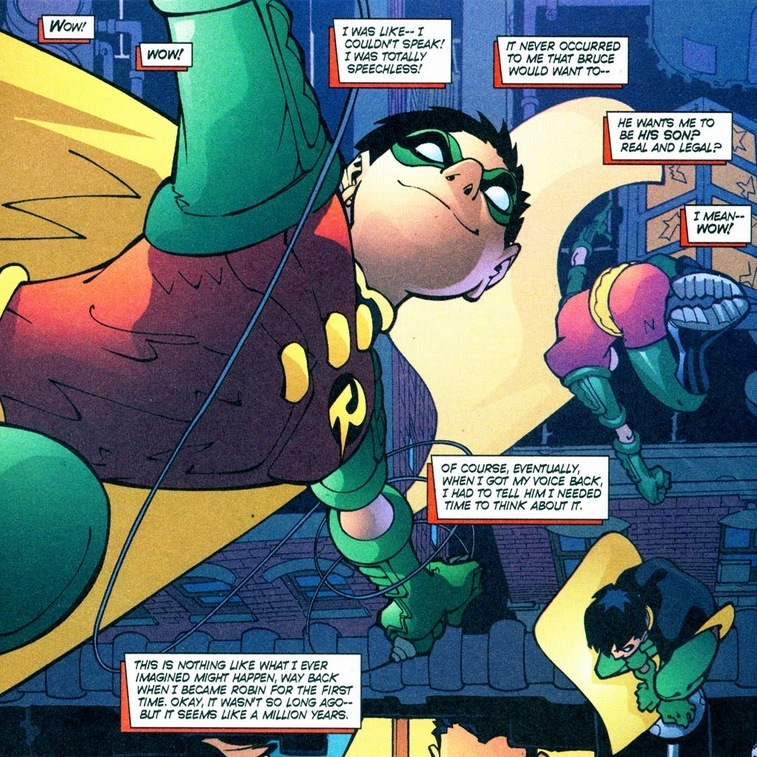 Tim was and always will be my favourite Robin. However, like many great heroes, even he has his fair share of clunker stories. I like to blame it mostly on company wide events that mess with the continuity in individual titles.